In Montana for his brother’s nuptials, Jackson Cardwell isn’t looking to be anybody’s hero. But the Texas single father knows a beautiful lady in distress when he meets her. “I’m afraid to ask what you just said to your horse,” Jackson joked as he moved closer. Her horse had wandered over to some tall grass away from the others. “Just thanking him for not bucking me off,” she admitted shyly. “Oh, hopefully she wasn’t insulted.” Allie actually smiled. The afternoon sun lit her face along with the smile. He felt his heart do a loop-de-loop. He tried to rein it back in as he looked into her eyes. That tantalizing green was deep and dark, inviting, and yet he knew a man could drown in those eyes. Suddenly, Allie’s horse shied. In the next second it took off as if it had been shot from a cannon. To her credit, she hadn’t let go of her reins, but she grabbed the saddle horn and let out a cry as the mare raced out of the meadow headed for the road. Jackson spurred his horse and raced after her. He could hear the startled cries of the others behind him. He’d been riding since he was a boy, so he knew how to handle his horse. But Allie, he could see, was having trouble staying in the saddle with her horse at a full gallop. He pushed his harder and managed to catch her, riding alongside until he could reach over and grab her reins. The horses lunged along for a moment. Next to him Allie started to fall. He grabbed for her, pulling her from her saddle and into his arms as he released her reins and brought his own horse up short. He didn’t know. One minute her horse was munching on grass, the next it had taken off like a shot. ALLIE HAD NO idea why the horse had reacted like that. She hated that she was the one who’d upset everyone. “Are you sure you didn’t spur your horse?” Natalie asked, still upset. “She isn’t wearing spurs,” Ford pointed out. “Maybe a bee stung your horse,” Natalie suggested. Dana felt bad. “I wanted your first horseback riding experience to be a pleasant one,” she lamented. “It was. It is,” Allie reassured her, although in truth, she wasn’t looking forward to getting back on the horse. But she knew she had to for Natalie’s sake. The kids had been scared enough as it was. Dana had spread out the lunch on a large blanket with the kids all helping when Jackson rode up, trailing her horse. The mare looked calm now, but Allie wasn’t sure she would ever trust it again. Jackson met her gaze as he dismounted. Dana was already on her feet, heading for him. Allie left the kids to join them. “What is it?” Dana asked, keeping her voice down. Jackson looked to Allie as if he didn’t want to say in front of her. “Did I do something to the horse to make her do that?” she asked, fearing that she had. Someone is hell-bent on making Allie Taylor think she’s losing her mind. Jackson’s determined to unmask the perp….. Can he guard the widowed wedding planner and her little girl from a killer with a chilling agenda? 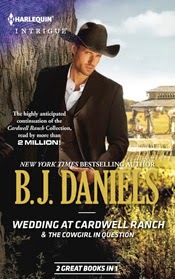 Find out what happens next in WEDDING AT CARDWELL RANCH by NEW YORK TIMES bestselling author B.J. Daniels, available July 2014, only from Harlequin Intrigue. B.J. Daniels wrote her first book after a career as an award-winning newspaper journalist and author of thirty-seven published short stories. That first book, Odd Man Out, received a 4 ½-star review from Romantic Times magazine and went on to be nominated for Best Intrigue for that year. Since then she was won numerous awards including a career achievement award for romantic suspense and numerous nominations and awards for best book. Daniels lives in Montana with her husband, Parker, and two springer spaniels, Spot and Jem. When she isn't writing, she snowboards, camps, boats and plays tennis. She is a member of Mystery Writers of America, Sisters in Crime, Thriller Writers, Kiss of Death and Romance Writers of America. Great excerpt! Sounds like a good read.